28 is a composite number. 28 = 1 x 28, 2 x 14, or 4 x 7. Factors of 28: 1, 2, 4, 7, 14, 28. Prime factorization: 28 = 2 x 2 x 7, which can also be written 28 = 2² x 7. When 28 is a clue in the FIND THE FACTORS puzzles, the factors will be 4 and 7. Begin by looking for perfect square clues, 1, 25, 49, 64, 81, 100, 121, or 144, because there is only one way to factor any of them so that both factors are numbers from 1 to 12. IF you find one of THOSE perfect square clues, write down its factors in the corresponding factor row and factor column. Next locate a row or a column with at least 2 clues. Find ALL the common factors of that row or column that will allow you to write only numbers from 1 to 12 in both the factor row and the factor column. If that row or column has more than one common factor, leave it alone for now. 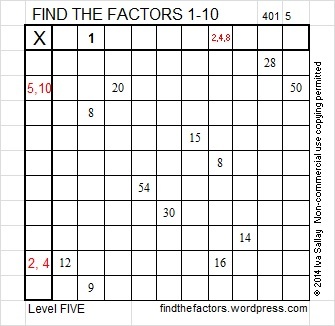 In a level 5 puzzle there will be at least one row or column that has only one common factor. When you find such a row or column, write its factors in the corresponding factor cells. 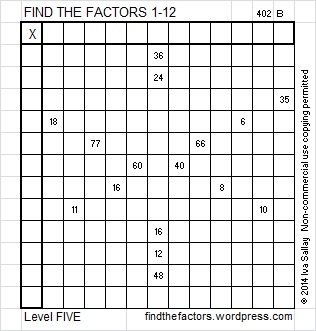 Let’s use the level 5 puzzle from wk 1 – 2014 as an example. Starting at the top of the puzzle look at all each row to see if it has more than one clue. We notice that there are two rows with 2 clues, but in both cases, there is more than one possible common factor, so we will ignore those rows for now. Starting on the left, look at each column to see if it has more than one clue. There are 2 columns that have 2 clues, and one of those columns has 3 possible common factors. If you were to guess which of those factors were correct, you would have a 67% chance of guessing wrong. Guessing and checking leads to frustration. Use logic and start with the column that has only one possible common factor, in this case: 1. Continue to look at all the clues and use logic until all (or almost all) of the factors are found. If a row or a column contains no clues, use logic is determine which number from 1 to 12 (or 1 to 10) should be written there. 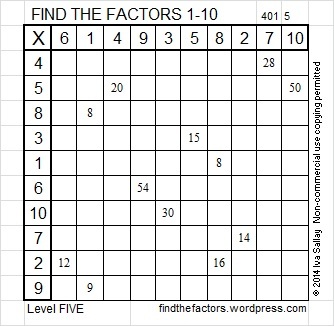 While working on these puzzles, occasionally count from 1 to 12 (1 to 10) as you examine numbers in the factor row and factor column to make sure that a number is written only once in either place. Good luck!